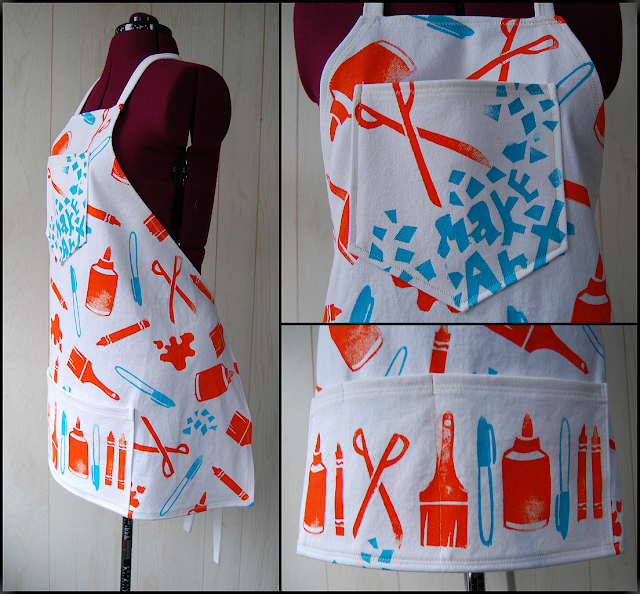 I made another screen printed apron. This one was for my mom, who is also an art teacher. Her name was printed across the front pocket, which is why I'm showing a side view. 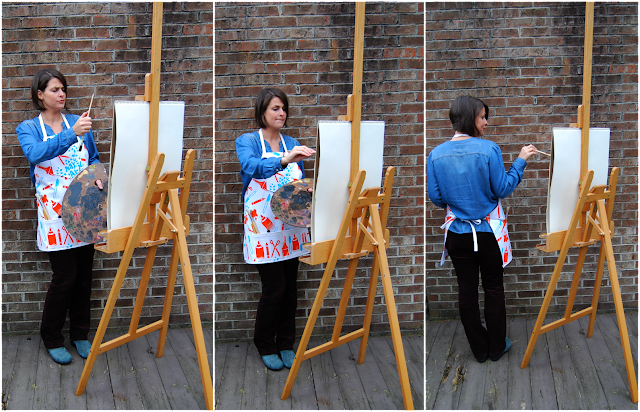 I used a heavy weight denim for the apron and white ink to print. 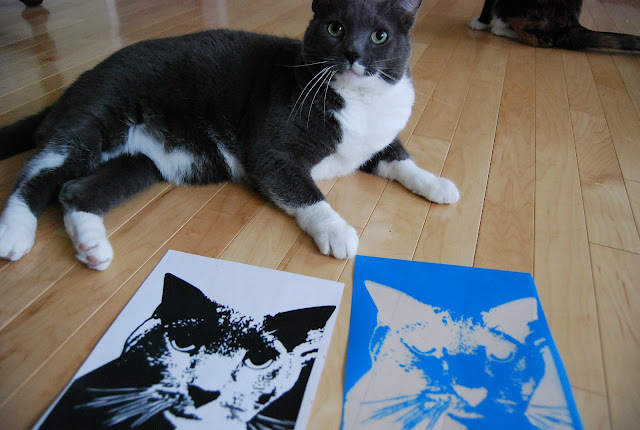 I also used my same art supply drawings to cut my stencils. My screen prints were a lot better this time around. I didn't do anything differently. I used all the same supplies I did before, but I was careful about stretching the sheer fabric really, really taut. I also didn't skimp on ink. I squirted out more than enough for each print. I really enjoy this home screen printing process. 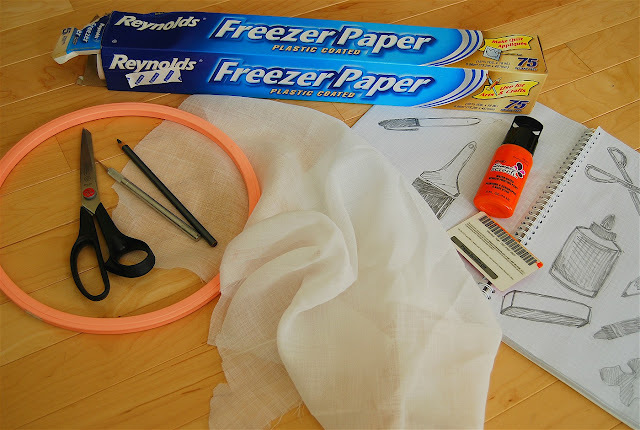 It's different than just using a freezer paper stencil because you can print the same stencil over and over again (since the stencil is fused to your screen instead of your fabric). I am working on a way to make it accessible and easy for my students. Maybe my art club should print their own tee shirts. How cool would that be? Hey you, Apronalongers. My name is Liza Jane and I am super excited to be guest posting here at Did You Make That? I hope you are all having major success in making your aprons and looking like domestic goddesses. I know I enjoyed making mine. My apron is not for doing domestic duties, if you can’t already tell from my photos. I’ll be honest, I’m not very good at doing any sort of domestic duty. My apron is for work. My day job is an elementary school art teacher. 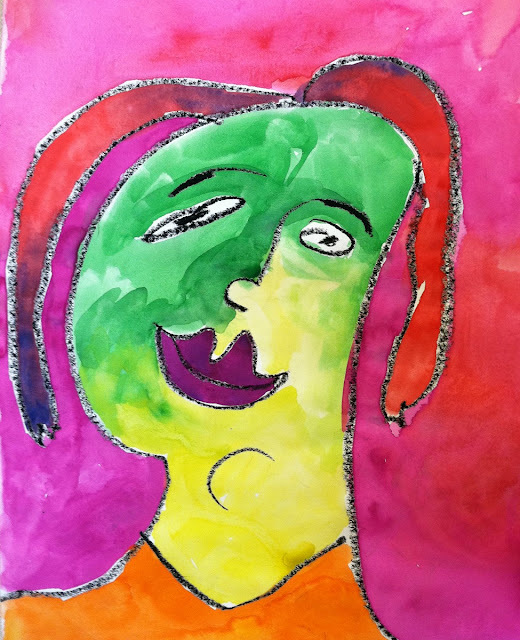 I teach art to around 650 five through eleven year olds every week. Calling my job messy is an understatement. My days are calamitous. Practically everything I own has at least one spot of paint or ink or glue or glaze on it, though I tend to still wear things if it’s just a little spot. 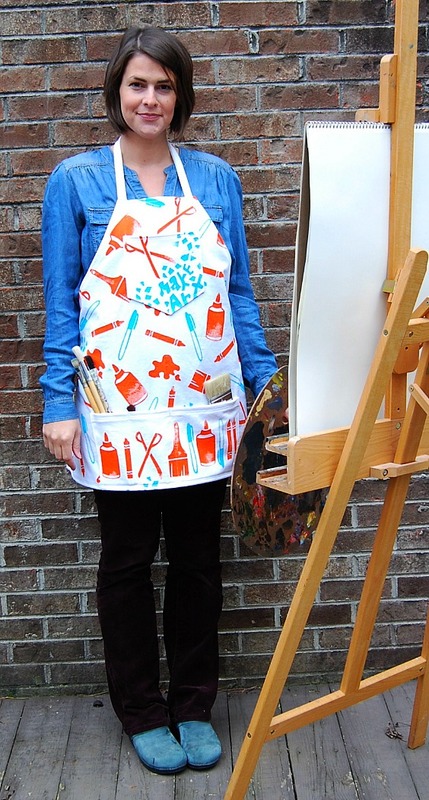 An apron is my saviour for keeping the big stuff off my clothes. I wear an apron all day long. I’ve even caught myself leaving for the day with it still on before. 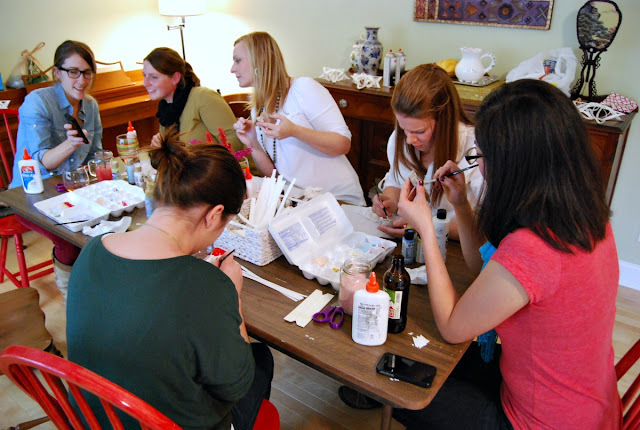 So when Karen asked me if I’d like to guest post for the Apronalong, I jumped at the chance to make a new one. And I took a little creative license in creating the fabric. I’ll start with the boring details first. 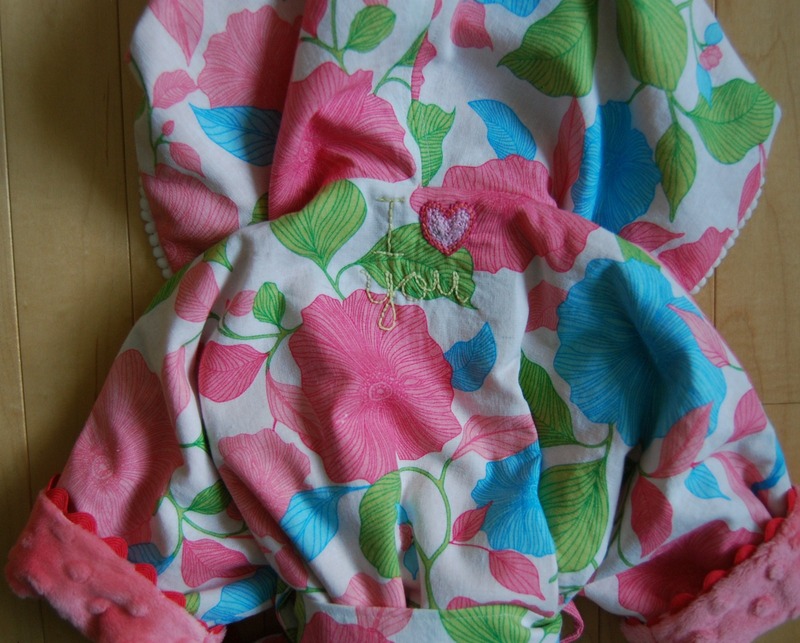 I did use a pattern, though really I could have just traced around an old apron had I had one handy. I toyed with the idea of making a fancy, frilly apron. But in the end, I decided utilitarian was the way to go. My apron covers me and has pockets. That’s all I need. I snagged Simplicity 9565 at a 99 cent sale and used it for the pattern pieces. 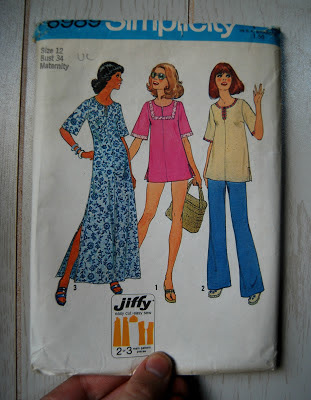 Yes, that is a “Sewing for Dummies” pattern– which is totally appropriate for me most of the time. I just used the pieces and put the apron together the way I thought it should be put together. I can’t comment on the instructions except that they looked super in depth. I used a white cotton bull denim so my apron is heavy duty and hardy. Now I bet you’re wondering where I found my totally appropriate art teacher fabric. And if you’re not, well then… too bad. Indulge me, please. I screen printed it myself and I’m awfully tickled with how it came out. It’s definitely not perfect screen printing. In fact, a lot of my individual prints are pretty poor. But I’ll tell you why that happened. I’m really just excited about testing out the process. I’m truly a printmaker at heart and I love process. I think that’s one of the reasons I love sewing so much, too. This is not a tutorial. It is just an explanation of what I did. I was inspired by a photo I spied on Pinterest this summer. 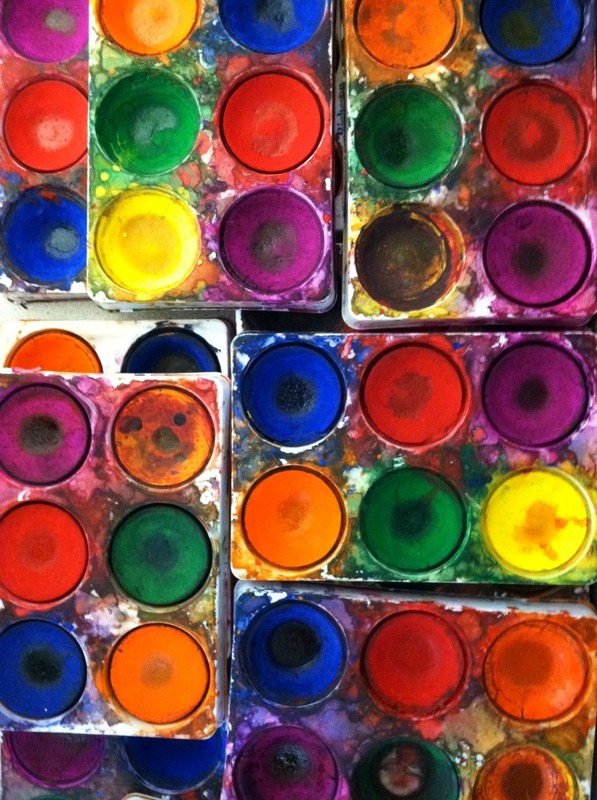 I’m always on the lookout for simple ways to do more complicated art processes so I can adapt them for teaching kids. I like to keep things easy. So this is super basic screenprinting. These are the supplies I used. My screen was actually a piece of polyester window sheer fabric. I have about six yards of this in my stash and it has been there for about three years now. Obviously my illusion of making curtains for my giant picture window fell through. The fabric was not ideal. 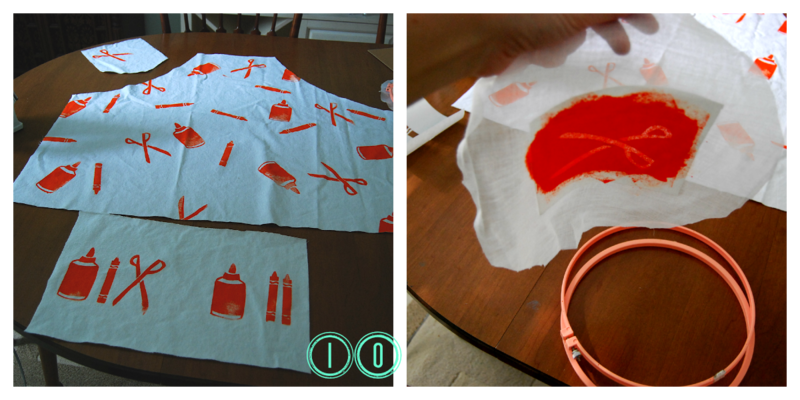 If I did this again, I would use actual silk (as in silkscreen…). Or I would use a sheer fabric that was smoother and had a tighter weave. This fabric had an uneven weave and it was pretty scratchy, which made it difficult to attach my stencil. The sheer fabric was stretched in a embroidery hoop. My stencils were made from freezer paper. I cut my stencils with an x-acto knife. And I printed with a screen printing ink from a local hobby store and used an old credit card as my squeegee. 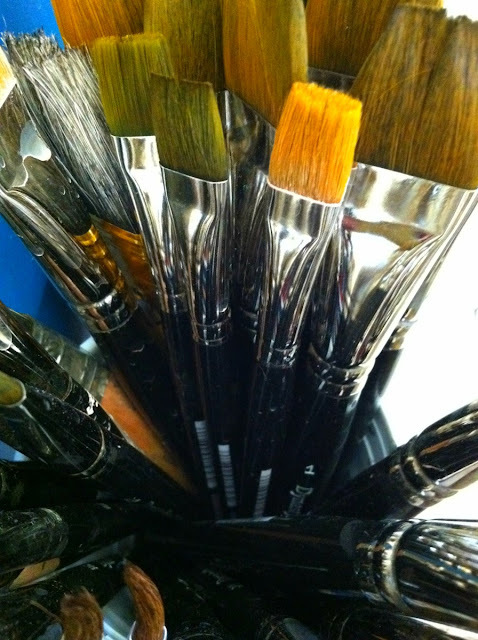 I sketched some art supplies before I started. I tried to think about the objects in terms of positive and negative space since I would be cutting each as a stencil. Once I worked it out in my sketchbook, I traced the shape (1) on to a scrap of freezer paper sized to fit on the embroidery hoop. I cut my stencil with an x-acto knife (2) making sure to save the pieces that needed to be fused separately. Then I stretched my screen in the embroidery hoop (3) taking care to keep it as tight as possible– like a drum. Next, I fused the stencil to backside of my screen (4). 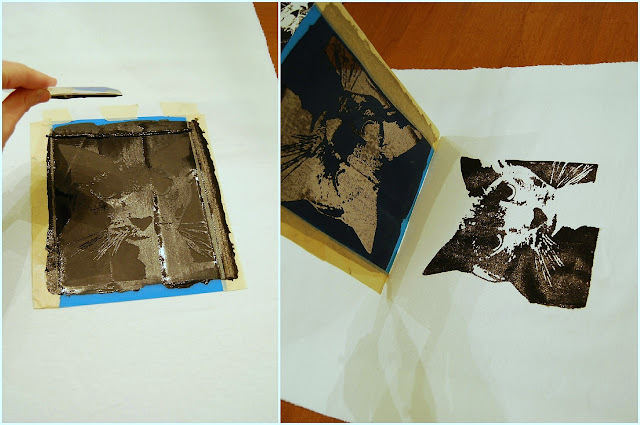 Here is a picture of how I fused the freezer paper stencil (5). I laid a scrap of denim on my crappy old dining room table. I don’t recommend ironing on your dining room table normally, but ours has really turned in to a hobby table. I’m going to paint it one of these days. Next, I laid the stencil, plastic coated side face up. Then I laid my stretched screen so the stencil would affix to the backside. Followed by another scrap of denim as a press cloth. And yes, my iron fit perfectly in my embroidery hoop. That was serendipitous. I’m not completely happy with the way the freezer paper stencil worked, but I think that was because it did not fuse seamlessly to my scratchy, rough weave fabric. 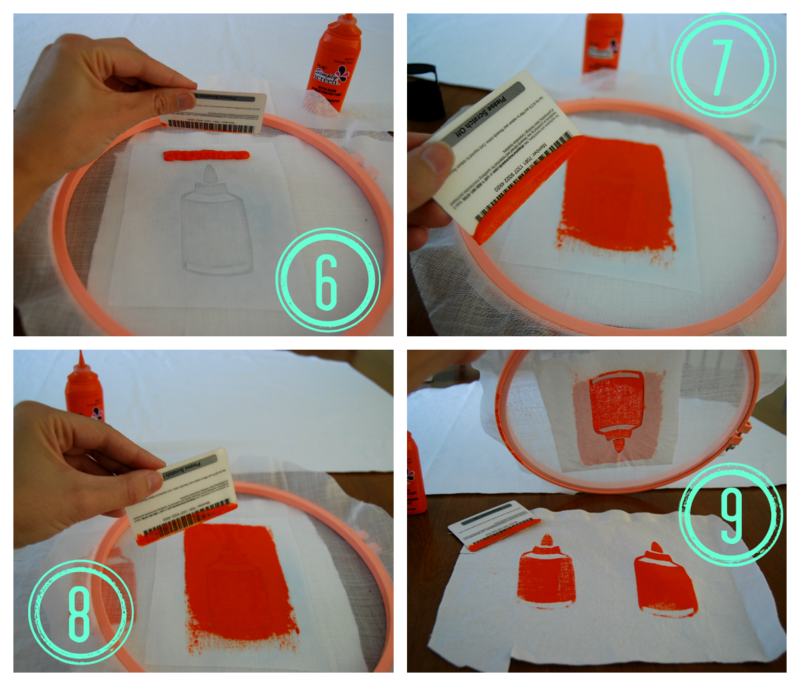 If I did this again, I would use contact paper or acetate to make a stencil like I’ve seen in other tutorials. Or better sheer fabric. 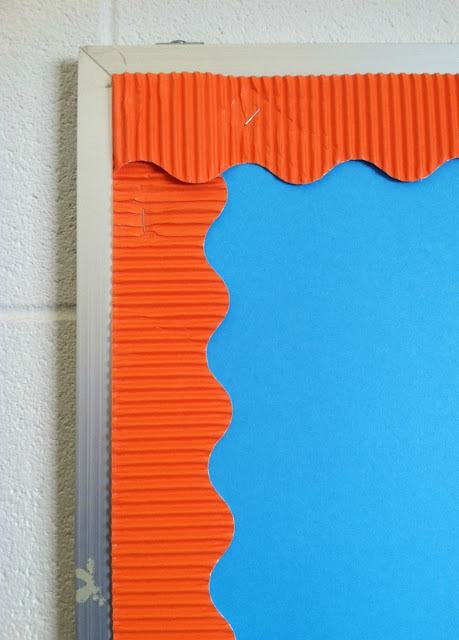 I saw another tutorial where someone painted glue on the screen to block out an image, but I would imagine that would make it hard to get a crisp edge. Once my stencil was fused in place I was ready to print. I laid my screen on my apron fabric and squeezed out a blob of screen printing ink at the top of the stencil (6). Leave enough room around your stencil so the ink doesn’t go off the edges. I used an old credit card as a squeegee to pull the ink down and through the screen (7). And then I repeated many, many times adding more ink as needed (8). Like I said before, my prints are not perfect (9). They got better as I went along. It took some practice to gauge whether I was using the right amount of ink. The larger stencils took a fair amount. 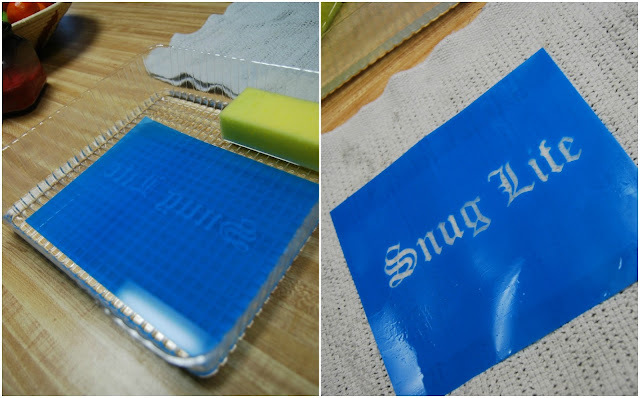 You don’t want to continue to push ink through the screen or it will squeeze under the edges of your stencil. I think my images would be a lot clearer with a smoother fabric. But this is quick and dirty screen printing. The best part is that the screen is easy to create and dispose of. I took the whole screen out of the embroidery hoop when I was finished with it and then created the next (10). The fabric paint I used dried enough in between stencils that I didn’t smear previous prints when I added more images to my apron. And that’s it! 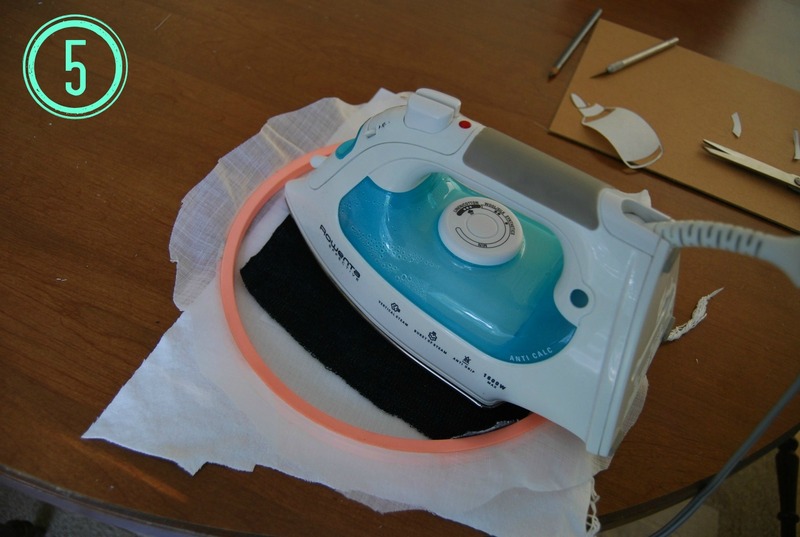 I heat fixed my screen printing ink after letting it dry and sewed up my apron in no time. I love it. I love it so much, in fact, that I haven’t worn it at work yet. I don’t want to get it messy. Hmmmmmm…….. Thanks so much for having me, Karen! Wishing everyone a fantastic New Year! Hope it's full of sewing, fun and never ending bobbins! I had a Christmas party at my house a couple of weeks ago. 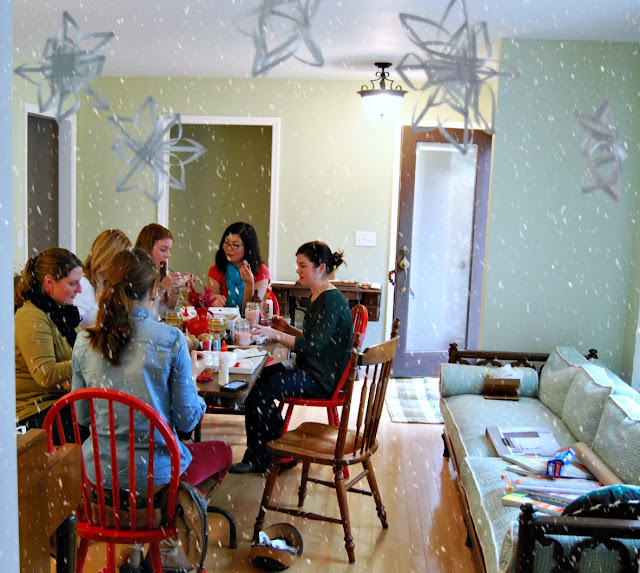 A few girlfriends came over one Saturday afternoon for the festivities. But this was not your ordinary Christmas party. 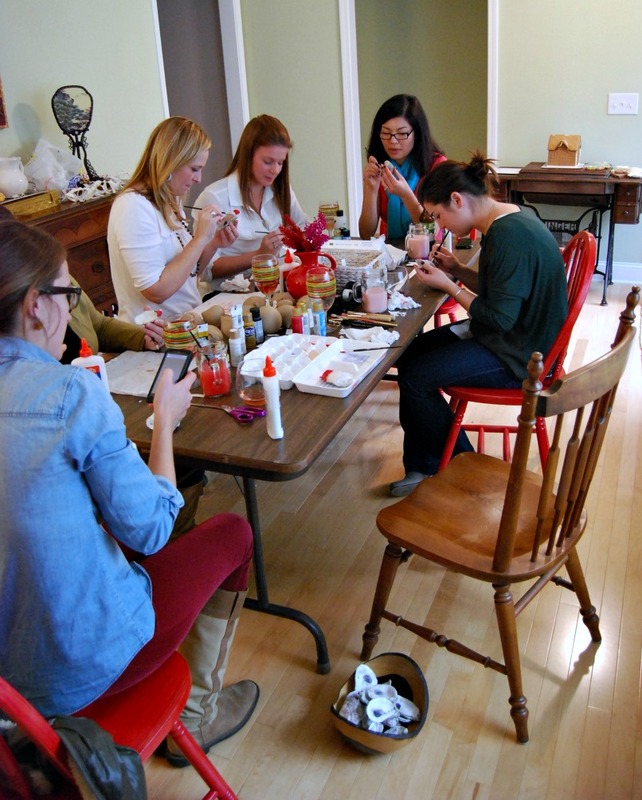 It was a crafty Christmas party. Complete and utter craftiness. I set up a cafeteria table in the middle of my living room for all the crafty fun. 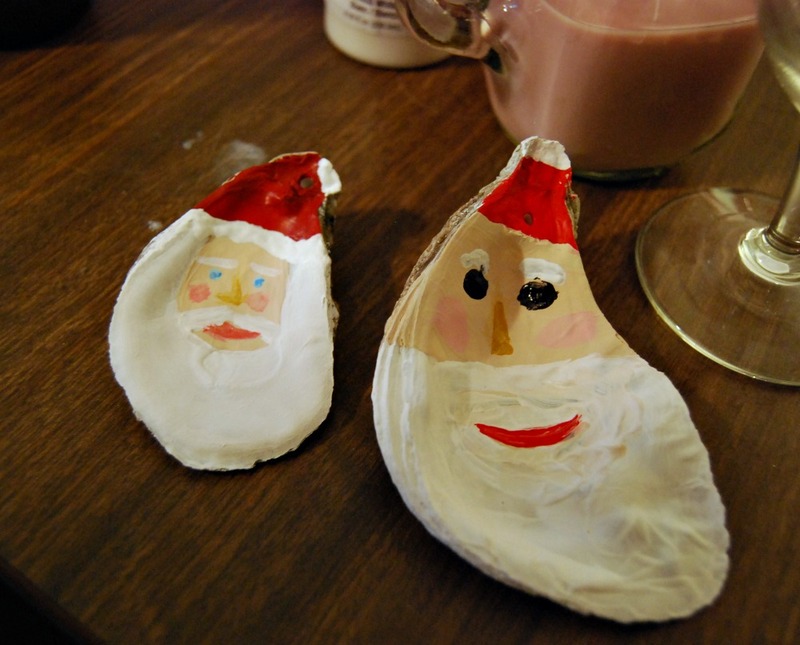 We made snowflakes, oyster santas and painted some paper mache ornaments as well. You can see the oyster santas below. They were my favorite. I had other things planned but we ran out of time. We decided to save some things for next year. Because this will be a yearly tradition from now on. Our crafty Christmas club. And did I mention there were cookies? 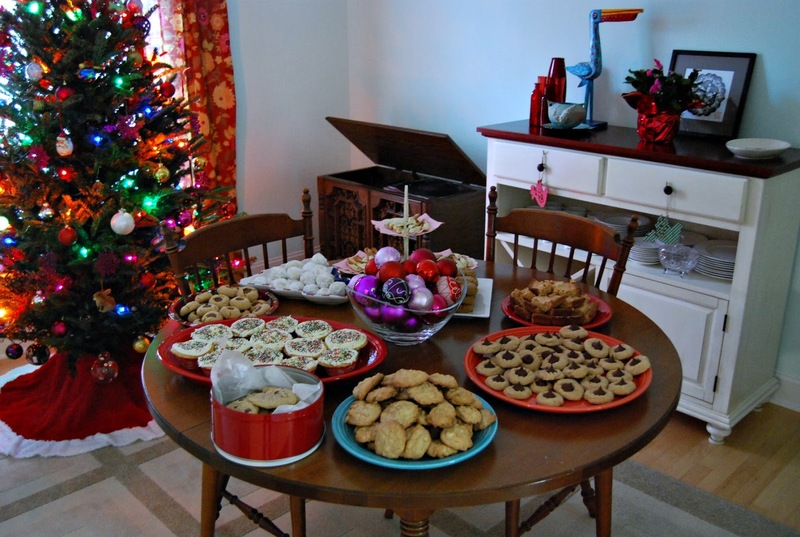 Everyone brought a batch of cookies for a Christmas cookie exchange. Except I think everyone brought more cookies than they took. I'm still happily noshing away. Baby likes Christmas cookies. I wanted to share the snowflakes with you. I think they are absolutely beautiful. I hung several variations in my doorways. 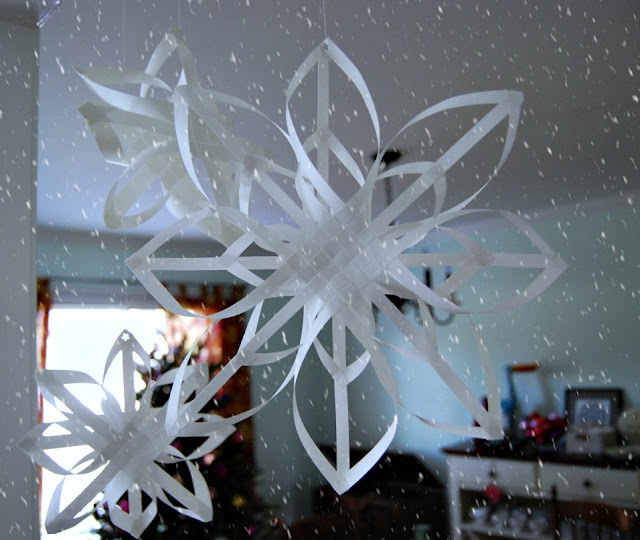 I actually have been making snowflakes since mid-November. I needed something pretty to hang in our school's cafeteria for our winter concert. I found instructions for making a Finnish star while browsing the internets. Apparently it's a Christmas craft from Finland. Someone from Finland want to verify that? Anyway, there are great instructions for making the basic star here. I call them snowflakes because that's what they remind me of. I made them with my fifth graders at school. It was hard, but they could do it. Albeit with a little bit of frantic finishing at the end of a 45 minute class period, but still. 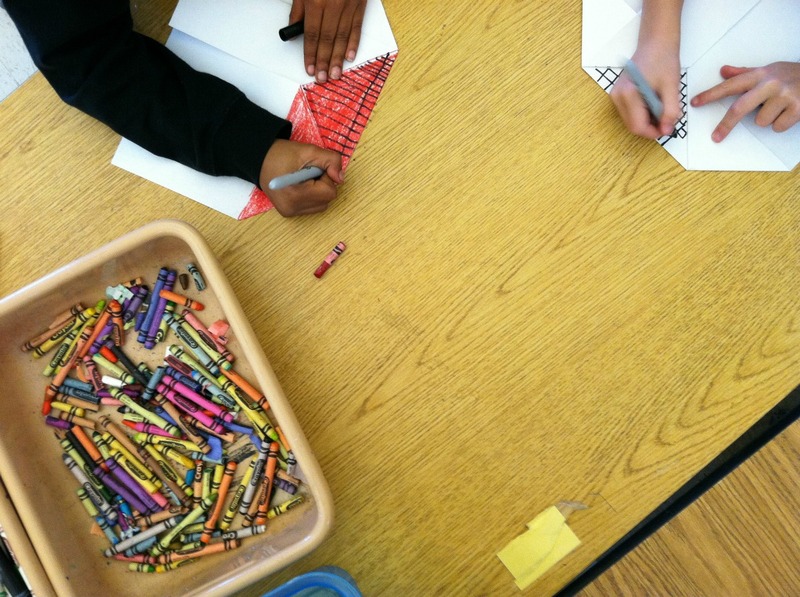 They get kind of panicky when they want to finish something before the end of class. What my fifth graders and I found out was that there is really no wrong way to make those petals (the strips that are curved around and glued together). 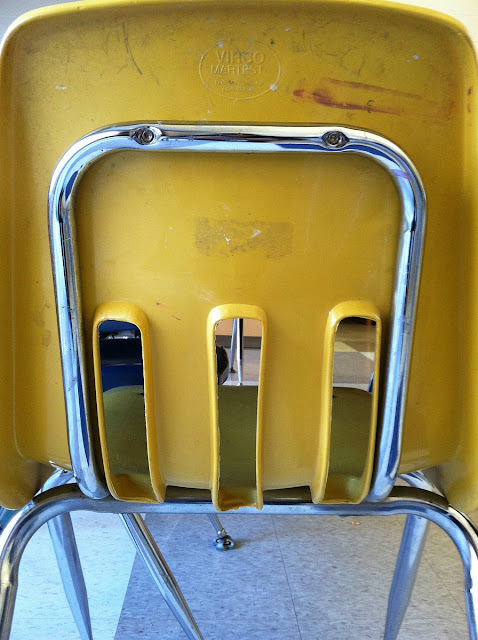 Some kids did it just right, some didn't twist them around, and some actually creased the strips instead of bending. They all turned out beautiful. And after all, no two snowflakes are alike, right? I experimented a little more at home. I played around with using different widths of paper and adding in more strips. 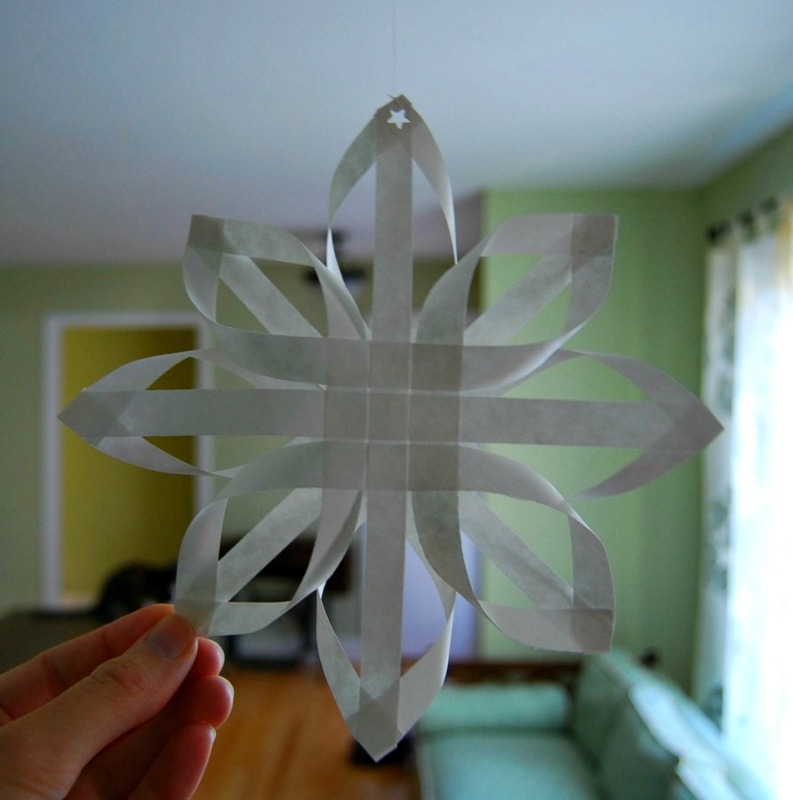 Below is a picture of how I made the snowflake with additional strips. Essentially, I curled the extra strips in to a smaller petal before gluing the two sides together. I originally planned a more elaborate how to post, but this photo will have to suffice. Click on it to make it larger. On a side note, thanks for the nice comments on my last post. I was very tentative about writing anything at all. I know what happened last week is weighing on everyone's mind. I guess I needed some way to express how I was/am feeling about it. I still don't know-- still can't really wrap my head around it. I want to do something. 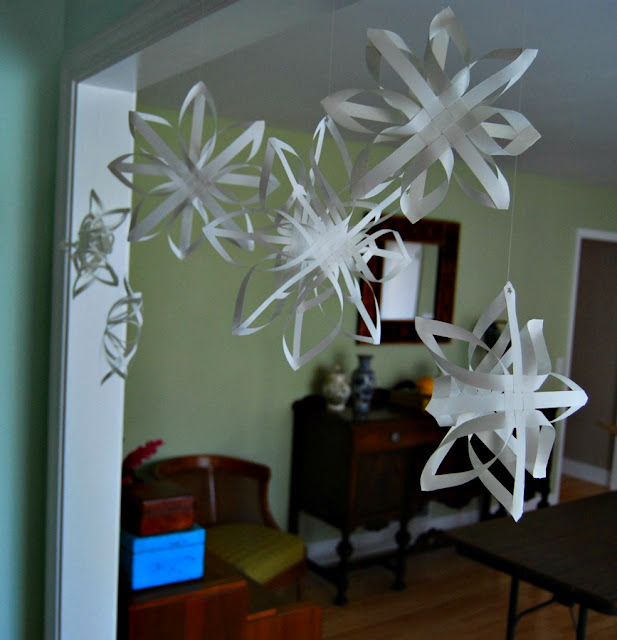 And luckily, as PoldaPop pointed out in the comments, the Sandy Hook PTA is requesting.... snowflakes! The information for donating snowflakes is found here. I'm planning on sending a few in, but maybe of the more traditional variety. I'm not sure these woven snowflakes will package well. My drive to work has been extremely difficult these past two days. Cheerless, at a time of year when it should be full of cheer. I can't wrap my head around it. I just can't fathom it. I know what happened on Friday was hundreds of miles away- not that it matters. But it doesn't feel that way. 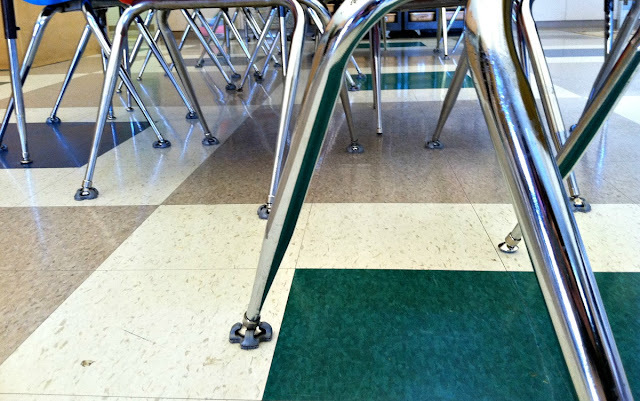 I know those hallways, those vinyl floors, those cinder block walls. I know what it sounds like, what it smells like, what it looks like. I know those teachers and staff. At least I feel like I do. The funny thing is, once I get to work the kids cheer me up. I know it's my job to teach and guide and counsel my students. But sometimes I feel like the tables are turned. And I am the one who is being comforted. It's a pretty amazing job. I don't ever want to forget that. I have also found comfort in prayer. I am praying for the families who lost and praying for those who survived. I am praying for the school and its faculty. And I'm praying for change. Big change. This is not meant to be a political post. Just contemplative. Writing this post was therapeutic. I didn't feel like I could write the post about some crafty Christmas nonsense I had planned to write this week. I hope we can all find our way forward. So why am I smiling? Oh. my. goodness. This was one of the worst experiences I've had with an envelope pattern, I believe. And so far I've had nothing but great luck with Burda envelope patterns. In fact, I get really excited about them because the designs are a little more unusual and the directions seem to be pretty clear. At least clearer than the magazine. 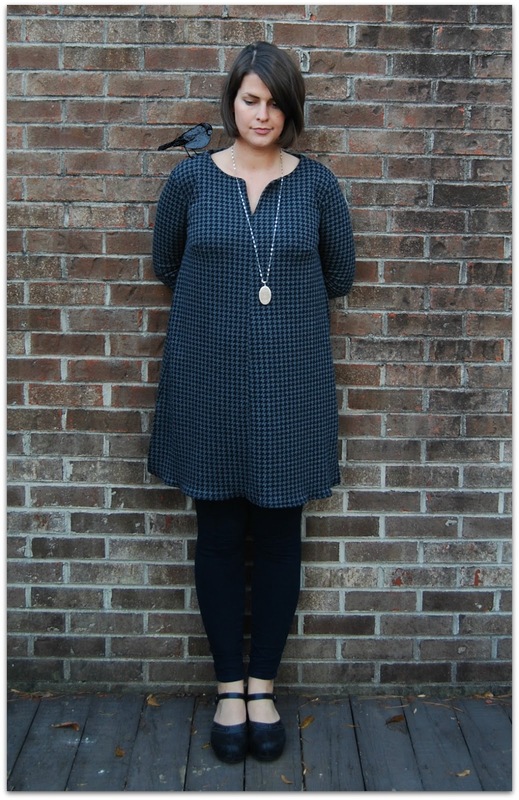 But this maternity pattern is a dud. It's fun to document our failures sometimes, don't you agree? I think it's necessary. Keeps me grounded in reality ;) I should split some of the responsibility for this fiasco. I'm going to say it was 33% the fault of the pattern, 33% the insanely dizzying striped knit I chose and 33% user error. I sound overly dramatic, I know. But I really, really wanted this project to turn out. I had a Christmas party last weekend and a Christmas function at work I planned on wearing this to. I had big plans for it. 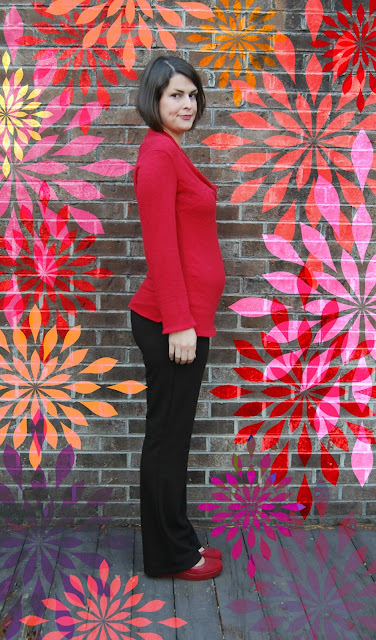 I wanted to flit around at both functions looking bump-tacular in a fitted stripey maternity dress. So I attempted to make up Burda 7356. I think the disappointment that it didn't turn out magnified the bad experience. I probably should claim a larger percentage for user error. Actually, lets just say it's mostly my own fault. If I had examined the pattern closely ahead of time, I would have figured out that there was no way this was going to make a fitted and flattering maternity dress. Yes, this top began life as a dress. 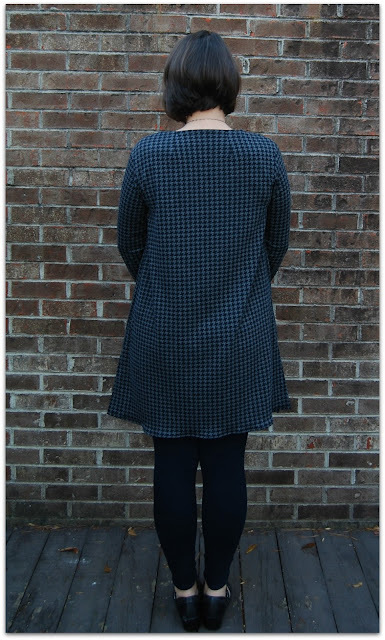 I made view B- the dress with the interesting half circle panels at the hem. For one, there is no seam at the back. And no elastic anywhere in the top. All the shaping is done with gathering. It is essentially a great big sack with a tuft of gathering at the front. Now that I know how the pattern turns out, I see why the model has her hand on the her waist in both photos. That's the only way there is any definition there. It's a sack. And not a good sack. My first major mistake happened when I was cutting out the pattern pieces. I had barely enough fabric to eke out the half circle panels. I cut those so the stripes were vertical. I had to cut the front bodice pieces separately. I thought I placed the grain line in the same spot when I cut both pieces. But I was mistaken. The horizontal stripes were ever so slightly different. And I didn't realize it until later. I spent hours unpicking, gathering and sewing the front together trying to figure out why my stripes never matched up and it looked so wonky. I finally figured it out. So I shifted one bodice piece up slightly to straighten the stripe. I ended up shaving about 1/2" off the neckline. That, of course, caused problems, too. I was not impressed with the instructions for constructing this pattern. I don't know about you, but I don't like gathering knit fabric. I don't find that it holds and sort of un-gathers over time. The stretch messes with the gathering in my opinion. I stitched clear elastic over all my gathering to hold it in place. I also think the front tuft of gathering that's supposed to accommodate the belly is done sloppily. There is a lot of gathering there and nothing to hold it there. That little loop is just a piece of fabric pulled through two slits and stitched inside. The finish is messy. Droopy and sad. I did what I could to neaten it by stitching the loop so it didn't shift and show all the seams underneath. Anyway, I could ramble on about how long it took me to realize this wasn't going to work as dress but I won't. I spent all weekend working on this. All weekend. When I finished it, I put it on and it was a hot mess. I was too mad to take a photo. The half circle panels looked horrendous. I had no clue how the instructions were explaining how to attach them They were large circles folded in half, stitched wrong side to right side of dress. Weird. And no hemming. 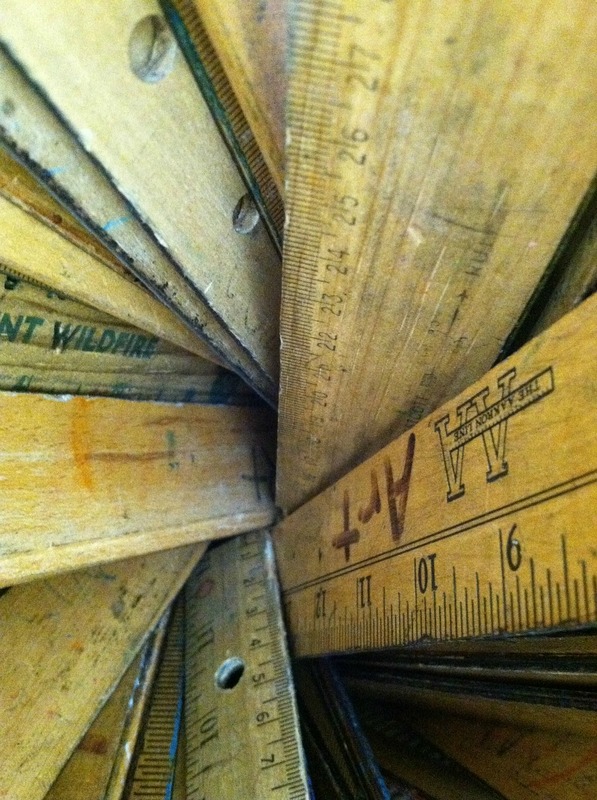 The instructions have you leave the panels with a raw edge at the bottom. Again, it looked sloppy. So I chopped it all off and made it in to a top. Now here's one more strange part. I used the fabric's stripe to cut this shorter. Since I had carefully matched my stripes at the side seams, I chose one stripe at the right length and begin cutting across that stripe to shorten the whole thing. As I made it around the top, I ended up one whole set of stripes above where I started. How is that possible?! It was like an optical illusion. I could not figure out why I ended up on a different stripe. It tried one more time before I took it to my dress form to measure the hem as accurately as possible. Can stripes be "off-grain" in a knit? And now I see that the hem is lower in the back. Sigh. I made a fantastically sloppy, droopy maternity tee shirt. 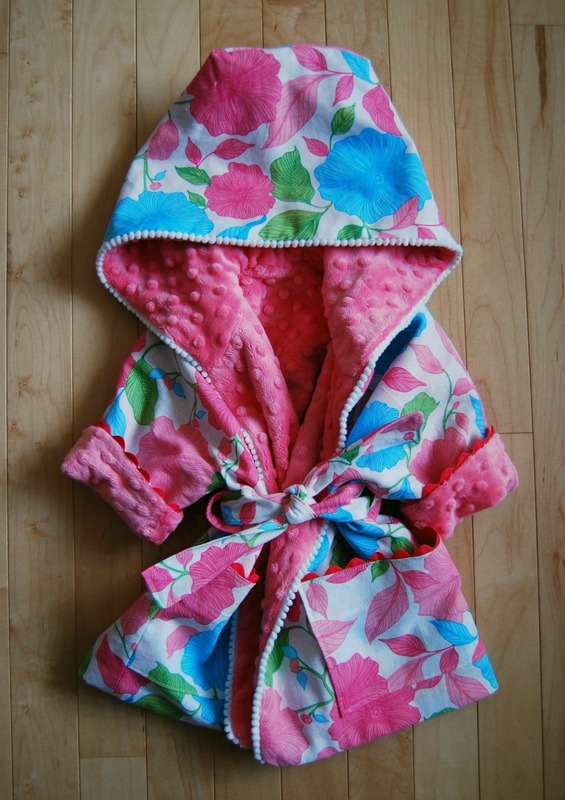 For someone who's pregnant in the dead of winter. Maybe I'll be glad I have it when I'm as big as a house at the end. You can't win em' all, I say. I won't be making this pattern again. That's for sure. I made another version of the same 1975 maternity pattern I posted about a couple of weeks ago. I have worn the first version many times already. It's comfy, roomy and I feel like it's funky enough that I don't feel like I'm wearing a huge maternity muumuu. So I decided to make it again. This time I tweaked a few things. I lowered the darts 1/2" and I think they are just right now. I straightened the shoulder seam ahead of time. 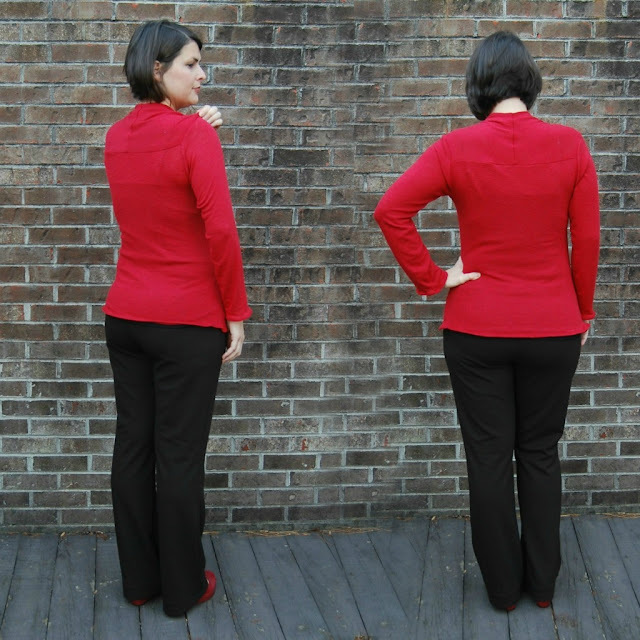 I made long, straight sleeves instead of the belled shorter sleeve. And I added six more inches to the length. The result is more dress than tunic. 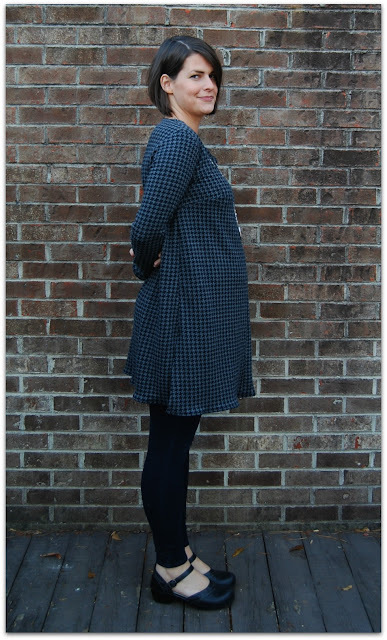 It's perfect for wearing over leggings, whether that is fashionable or not. I finally splurged and bought some maternity leggings and oh my gosh, why did I wait so long?! Holy cow, they are so comfortable they make me want to cry when I put them on. Like real tears of joy. I'm going to have to look in to some actual maternity pants now. I have three pairs of pants I can still wear at this point. Two are my normal pants that have a lot of stretch. They sit low, too, so the waist band sits beneath my belly. The other pair of pants is an elastic waist, ponte knit pant my mom bought me recently (thanks, mom!). 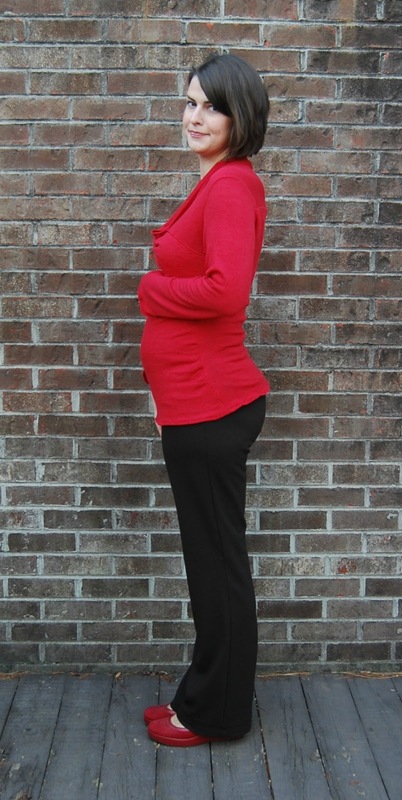 I think I'm about ready for the real deal, stretchy belly maternity pants at this point. I've been trying to wait as long as possible. I love the a-line shape of this tunic/dress. It's swingy and retro looking without being too in-your-face vintage. I used a houndstooth double knit I found at Hancock. It's synthetic, but its soft and warm. I'll be able to wear this until the end of my pregnancy, I think. Once again, I was too lazy to stabilize the knit before I hemmed the bottom edge. It's pretty ripply. Eh. I can't be bothered. I needed this to be quick and quick it was. Start to finish it took me a couple of hours. I also rounded off the points at the neckline. I didn't like the way the corners looked on my first version so I used a round glass to shave off the point with a curve. 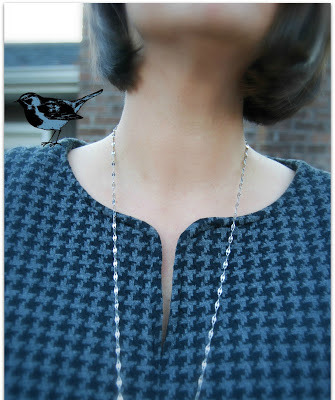 I did it when I sewed the neck facing. I had to top stitch afterwards because this synthetic knit does not press at all. The facing kept shifting outside, even with understitching. I really like the way the rounded edge looks, whether the collar stands up or flops over. Maybe not the most exciting piece, but I definitely count this one as a win. I know it will get lots and lots of wear. I'm actually thinking about making one more version of this pattern. Do I need the maxi version or would the volume be too much? And just for posterity, this is the bump at almost 23 weeks. Ack! It's going by so fast! 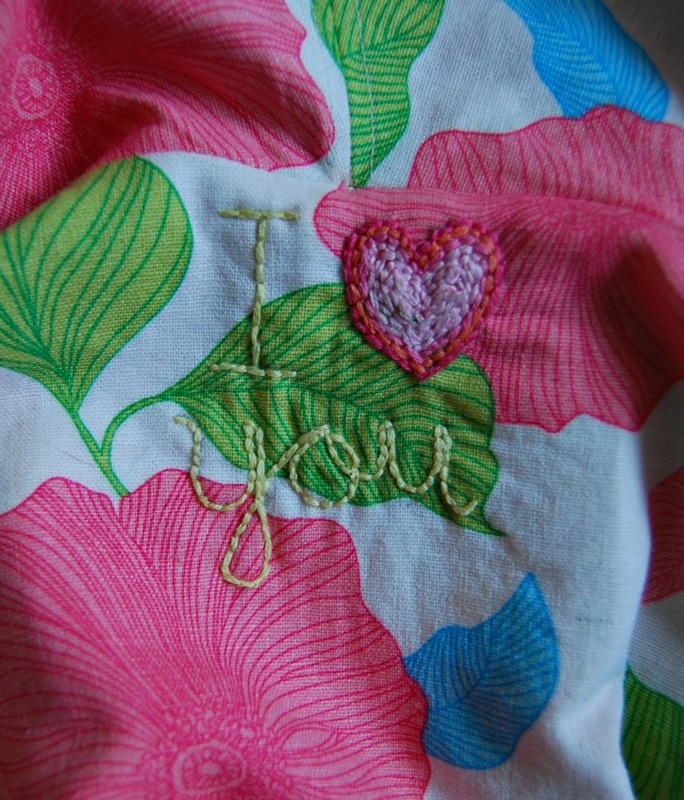 I love to sew for myself. 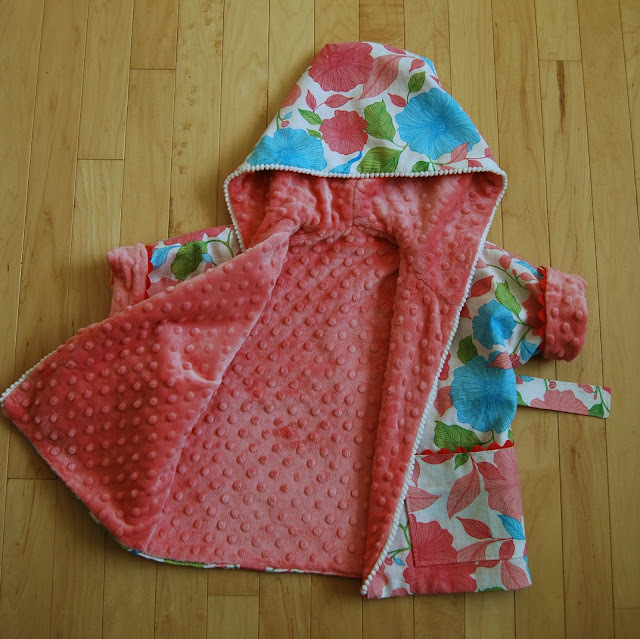 I've always admired those mothers out there in the blogosphere who lovingly craft clothing for their children. To take precious sewing time (of which there is very little to be had) and spend it creating something for someone else. Case in point: Kbenco. Have you seen the formal gown she just made for her daughter? It has a boned corselet, tulle underskirt, beaded hem and the bodice is made up of lattice smocking done by hand. It is spectacular. Absolutely spectacular. Who knows how many hours she put in to it. I followed her progress on her blog. When she wrote her first post about the dress, I was not yet pregnant. I remember being in awe of the huge task she was taking on of making someone else's dream dress. I was in awe, but in the "boy, kbenco sure is a sucker for punishment" sort of way. I mean, the lattice smocking? Man, I can't get over it. Ah. But now I understand. I foresee plenty of unselfish sewing in my future. And it will make no difference to me. 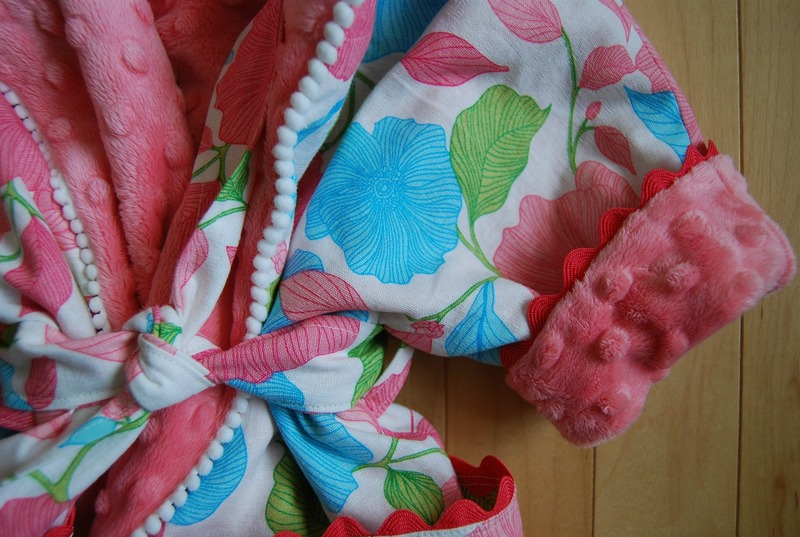 This little baby bathrobe is my go-to baby gift for friends. 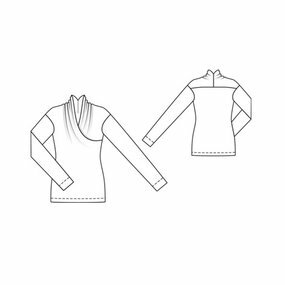 I drafted the pattern a while back from Winifred Aldrich's Metric Pattern Cutting for Children's Wear and Babywear. I've made so many of these in the past. Only this time I got to make one for my own baby. Normally it takes me about two hours to make one of these robes start to finish. I spent more than double on this one. 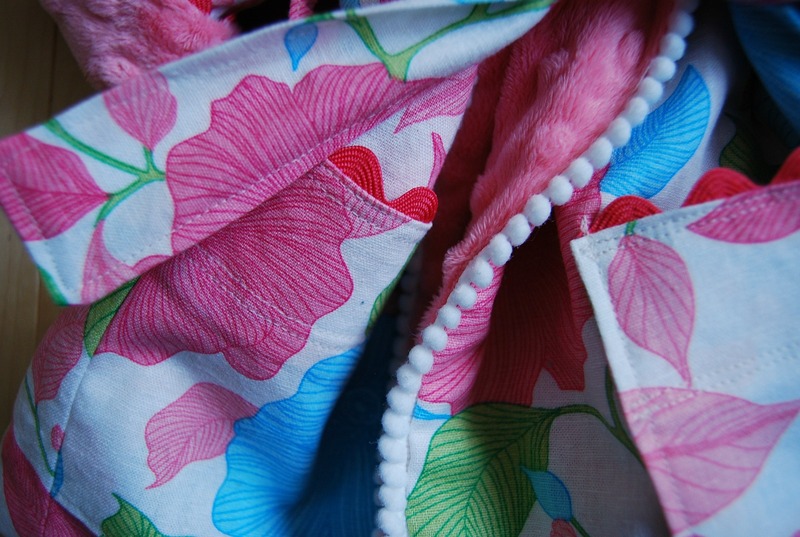 I wanted every stitch to be just right, every seam to be pressed and even and every detail to be perfect. And I enjoyed every minute of it. I get tired of my same old, same old brick chimney backdrop. And I like to play around with the seasonal goodies that PicMonkey puts out. Sorry. I decided to make something a little more snug for my bump after my 70's maternity top. 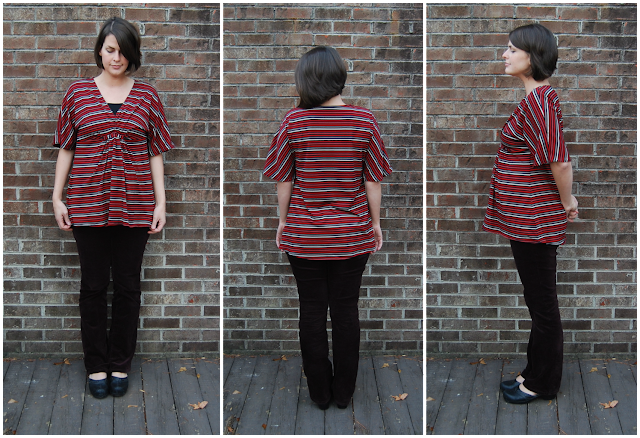 So I made up this Burdastyle knit wrap top from the 11/2011 issue. Molly made up this same top a few months ago and I really liked her version. I realized I had the perfect sweater knit in stash and that particular issue of Burda already. Only I did a little slash-and-spread to the front piece to accommodate a growing belly. I did a quick and dirty full belly alteration and added some length to the front so I could ruche the side seams to match the back. It sort of worked. I probably should have been a bit more technical about my alteration. But my knit is super duper stretchy, so I wasn't too worried about it. I cut a size smaller due to the stretchy nature of the sweater knit I used. It's some sort of lightweight acrylic knit I found at Hancock last year. Very warm and soft; two things I look for in clothing right now. The instructions were pretty good for Burda. This was the illustrated pattern of the issue, so that helped. Only the illustrated instructions were not on the page the insert said they were on, fyi. And after the instructions told you to put in the sleeve, they abruptly stopped. I guess Burda figures you know how hem. Anyway, those are nit-picky criticisms. And actually, the hem is the only thing I'm not happy with. Go figure. My knit was so soft and stretchy, I should have stabilized the hem before stitching it. It had to be hemmed, though, since this knit seems to unravel a bit at the edges. Do you see that rippling? I can't decide if I'll leave it, or fix it. I like my top. I don't love it, but I like it. I like the soft, slouchy-ness of it. One thing that bothers me is the fact that the sleeve seam slips off my shoulders and feels a little strange. I'm assuming it's supposed to be that way since there is no shoulder seam. I even caught myself in a photo sliding the seam back up on my shoulder. I also stitched down the sides of the front pieces where they crossover in the front. The drape part takes a while to situate just right otherwise. I figure the seam there just resembles a bust dart. It's pretty well hidden. Any clue why the back of my top rides up so much? Is my swayback becoming more extreme before my eyes? I think I've always had a slight swayback, but now I think I'm actually going to have to accommodate for it. With the belly I've got, I figured the front would ride up instead. I may not have slashed and spread the front wide enough. The side seam pulls toward the back. And my ruching is almost non-existent. I'll still wear it, though. It is comfy. And this is my little bump at 21 weeks. I think the snugger stuff makes the bump look a little bit smaller, if you can believe that. I feel huge, yet when I look at these photos I don't think I look very big. I'm sure that will change ;) I'll be cursing myself for saying I look small later on. 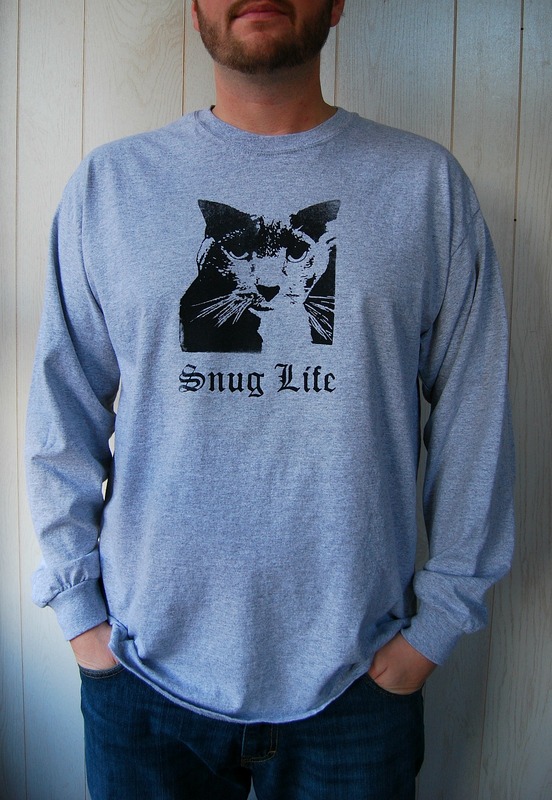 I agree with some of the comments on my last top that maybe the snug stuff is good for a bigger bump. Little bub is definitely growing. I felt some kung fu kicks and punches for the first time this week. It sure is wild! Yes, my husband is not ashamed to wear a picture of his cat on his shirt. A very literal version of wearing your heart on your sleeve I suppose. Tee hee. Love you, J.
J had a birthday last week. For his birthday gift, I finally got around to making a tee shirt that we had talked about making for years. The idea for this tee shirt was born while we were on our honeymoon three years ago. While walking around Old San Juan, we went in to a tee shirt shop where they had a pug life tee shirt on display. We thought it would be hilarious to make a snug life tee shirt instead. See, we have this cat. 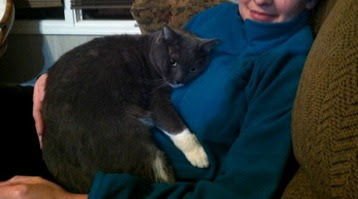 A cat named Socks who loves to snuggle. I mean SNUGGLE. I'll be honest, I've never seen anything like it. Neither has J. Socks will snuggle morning, noon and night. I wake up in the middle of the night and he will be flopped on his back with his head on my shoulder. He snuggles like a person. He snuggles so much that sometimes it's really annoying and you have to push him off. But you can't be mad at him for too long. I mean, how many cats do you know that are so loving? Our other cat is pretty indifferent to us. I went though our photo roll and found lots of snuggle pictures, but some are just too embarrassing to post. But here's one. Socks' story is a funny one. 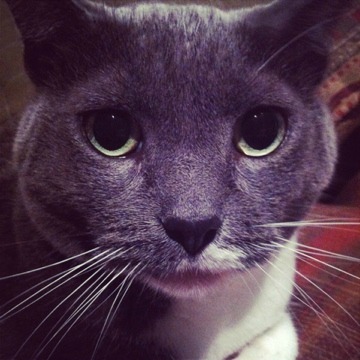 I was not a cat person before Socks. In fact, I often claimed I hated cats. Then my aunt asked me to cat sit for a year while she was doing humanitarian work in Africa. That's when I got Socks. He was a born in the gutter stray that she took in. J and I laugh about he would never have made it out on the streets with his proclivity for warm places and snuggle. He's too much of a wimp. Anyway, he snuggled his way in to our home. When my aunt came back from Africa, I couldn't let him go and she was kind enough to let me keep him. And now I can't believe I ever said I didn't like cats. Back to the tee shirt. 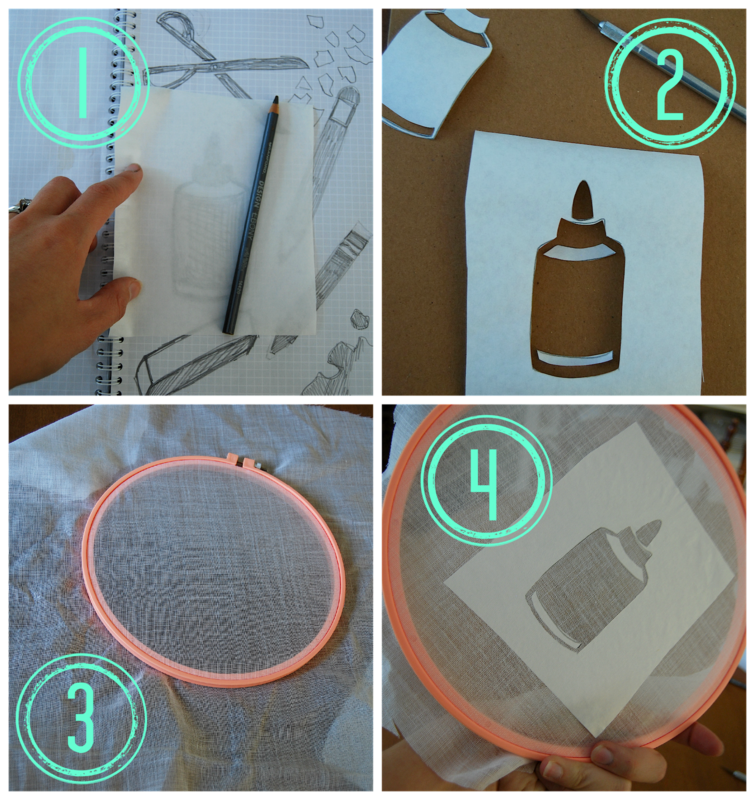 I wanted to try out a photo screen printing kit I saw at Hobby Lobby by Plaid. It was quite pricey ($40), but I used a 40% coupon which made it more reasonable. Still a little pricey for my tastes. I was not totally convinced it would work when I started this project. 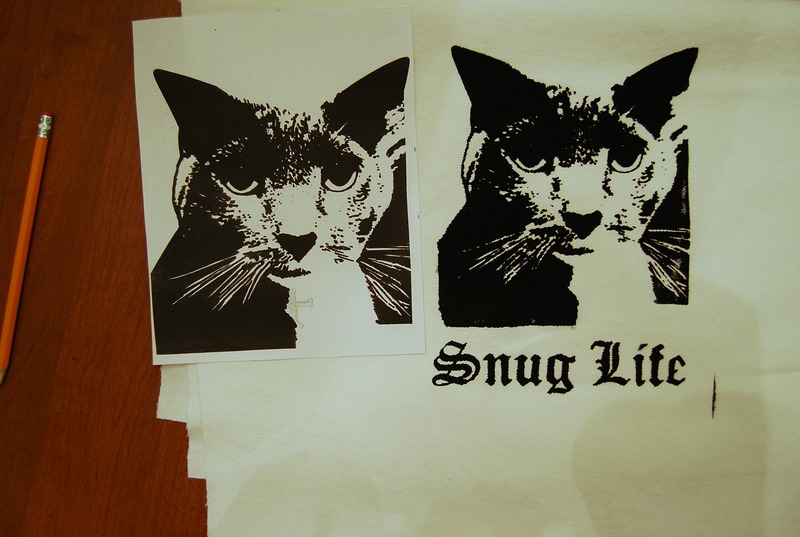 I did some photo silk screening back in college and I remember needing a lot of sophisticated equipment. We put photo emulsion on the screens in a dark room and used a huge glass light table to expose the screens. But this little kit does the same thing on a smaller scale. 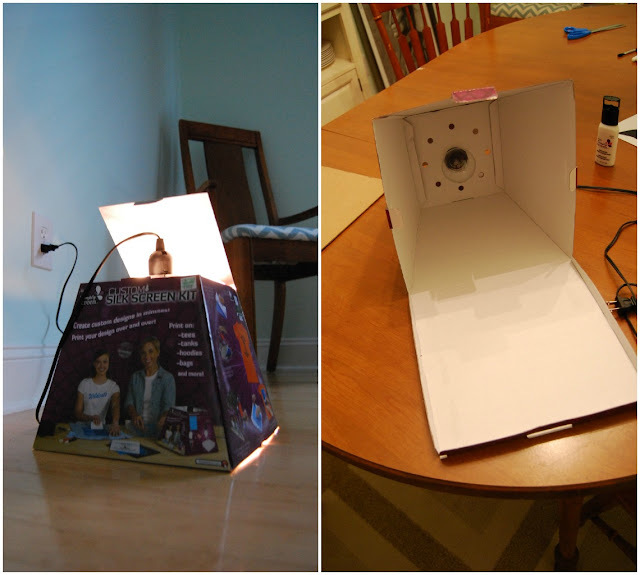 It came with three small screens that already had photo emulsion on them in a black bag, a box with a socket and light bulb to be used for exposing the screen, and supplies to actually print your image after you make your screen. All you have to do is print out the black and white image you want to use. I used the photo of Socks above but altered it in PicMonkey to be only black and white. In case you are wondering, I made it black and white first, played around with the brightness and contrast and then "posterized" it to only have two colors- just black and white. No grey. 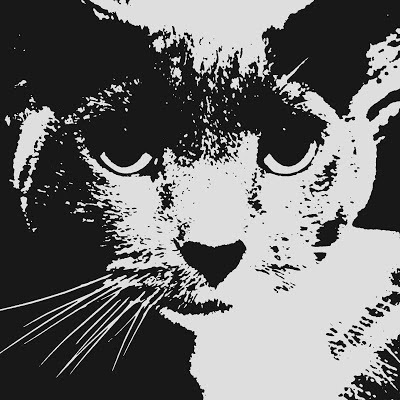 I did add to the image since we wanted to see the top of his ears and whiskers on the other side of his face. I worked back in to the image with a sharpie and then photocopied it. I just used regular paper, not a transparency. I laid my printed image face down on my screen and laid a piece of glass on top and then exposed it in the light box. I did not use a piece of glass the first time I tried it and my image was not as successful. The heat from the light bulb caused the paper to curl up even though I taped it down and missed a lot of detail. So I highly recommend using a piece of glass on top. I took a piece of glass out of a picture frame to use. After exposing the screen for 25 minutes, I soaked it and removed the emulsion to form the image. The emulsion that is exposed to light stays put and the emulsion beneath the black image is washed away. I had to put the text on a separate screen because we wanted the image to be as big as possible. Once the screen was dry I was ready to print. My image was way too close to the edges but I attached a wide masking tape border before I printed. That kept me from spilling ink over the edge of the screen. The size of the screens was a bit of an issue. I needed them to be just a little bit bigger. I did a few practice prints before I printed J's tee shirt. 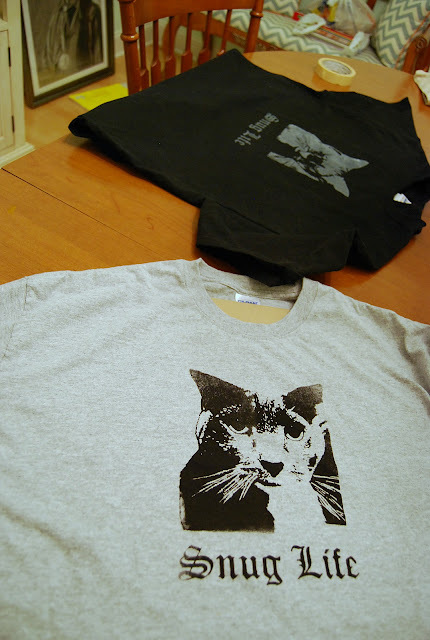 I actually printed two tee shirts for him; a white ink on black tee and a black ink on gray tee. I like the black image better. The white ink soaked in to the tee shirt and looked very faded, which is ok. I may make him one more. You can wash the screen and use it again. You can see below that the image is pretty close to the original print out. There were some minute details lost but it's pretty darn close. My only complaint is that the photo emulsion does not seem like it will last very long. The edges feel pretty gummy and the more times I washed it, the more I felt like the edges would peel up. I don't see it lasting for 50 prints like the instructions claim. 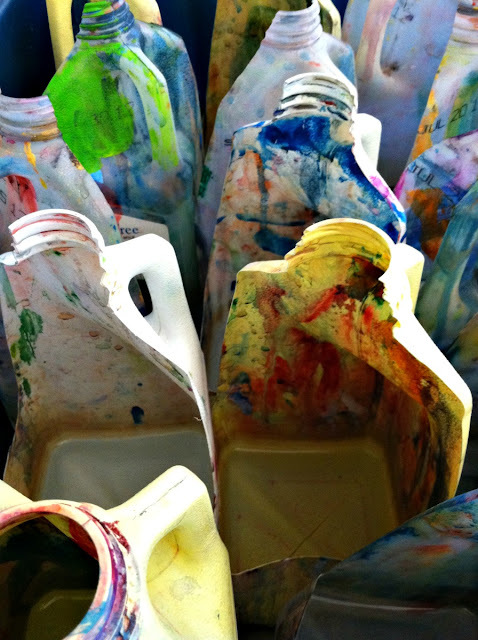 But it was great for making a few tees. The verdict on Plaid's Custom Silk Screening Kit? Fun and good for a printing a few small scale images. But pretty expensive. I wouldn't have bought it without the coupon. You can also buy replacement screens but they are pricey, too. Good thing Hobby Lobby lets you use a 40% coupon everyday if you like. And no, I didn't receive any free stuff or compensation for this post which is why I'm not linking to the product. You can look it up online if you are interested. Just my honest opinions. He's going to kill me for posting this photo, bwahahaha! J likes his tee shirt and that's all that really matters. 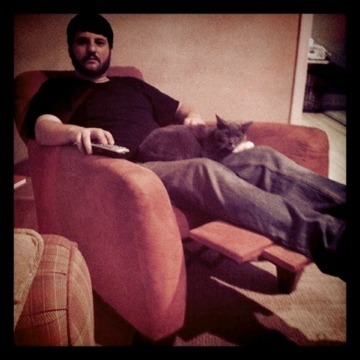 Happy Birthday to a man who is not ashamed to snuggle with his cat!